The IKEA Knappa pendant lamp is a lotus-like sculpted polypropylene pendant light. Casting soft filtered light through its many layered petals, the IKEA Knappa is a popular expressive light that adds an attractive focal point to many dining spaces. The IKEA Knappa pendant lamp has a diameter of 18” | 46 cm, height of 14.25” | 36 cm, maximum cord length of 15’5” | 4.7 m, and can hold up to a 60 W bulb. What is the IKEA Knappa Pendant Lamp? The IKEA Knappa Pendant Lamp is a sculptural lotus-like polypropylene pendant lamp designed by Brylle/Jacobsen for IKEA. 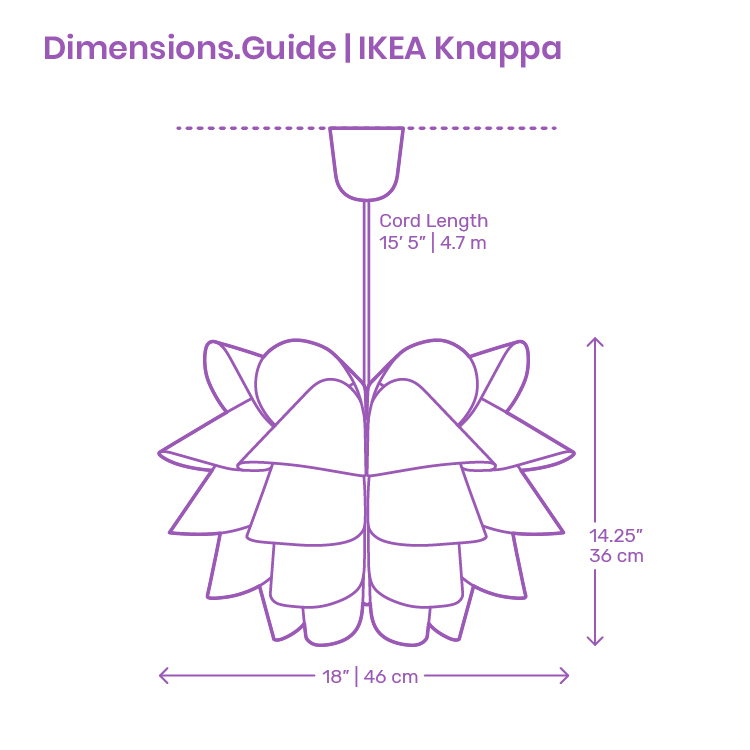 How big is an IKEA Knappa Pendant Lamp? The IKEA Knappa Pendant Lamp has an overall diameter of 18” | 46 cm and a shade height of 14.25” | 36 cm. How high should the IKEA Knappa Pendant Lamp be hung? Though it varies by situation and lighting needs, the bottom of the IKEA Knappa Pendant Lamp should be hung 28”-36” | 71-91 cm above a countertop surface or 30”-36” | 76-91 cm above a dining table.